A couple of us travelled up to Boon Hill to do some observing and time lapse photography. It so happens that we broke ground on the bunkhouse on Friday the 27th. I attended the OSP X star party in AZ in late May. The last weekend in March, I'm hosting a star party at Boon Hill, which is west of Cadillac Michigan. 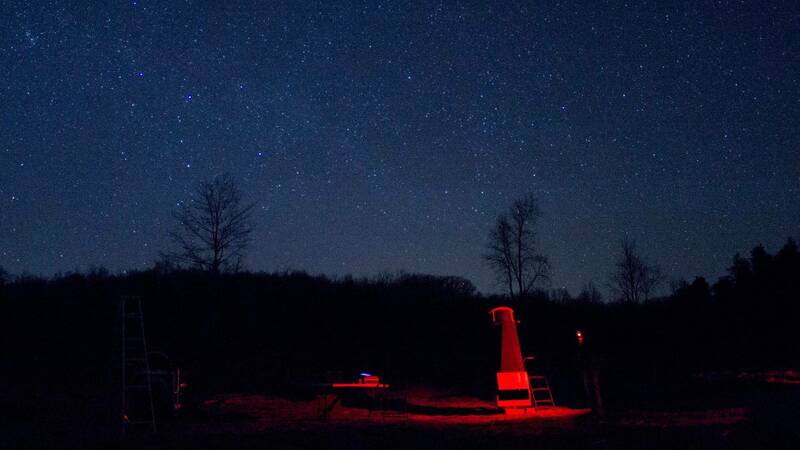 The last weekend in April, I'll be attending another northern michigan star party. The last weekend in May, I'll be attending a star party in Arizona. Although I've thought about going to the Winter Star Party, I've never been convinced it was worth it, since it isn't a dark sky location... Good seeing, but not any darker than my backyard. The summer will bring a couple of club picnics, and then it's on to the Fall events, of which there are at least 3. I may add one more back up at Boon Hill in late fall. We installed a new sub pier for the dob in the observatory. The 2013 Astronomy at the Beach is now over, and it was a great event, with possibly 4000 people showing up for the weekend event. Photos are at our Facebook group site.